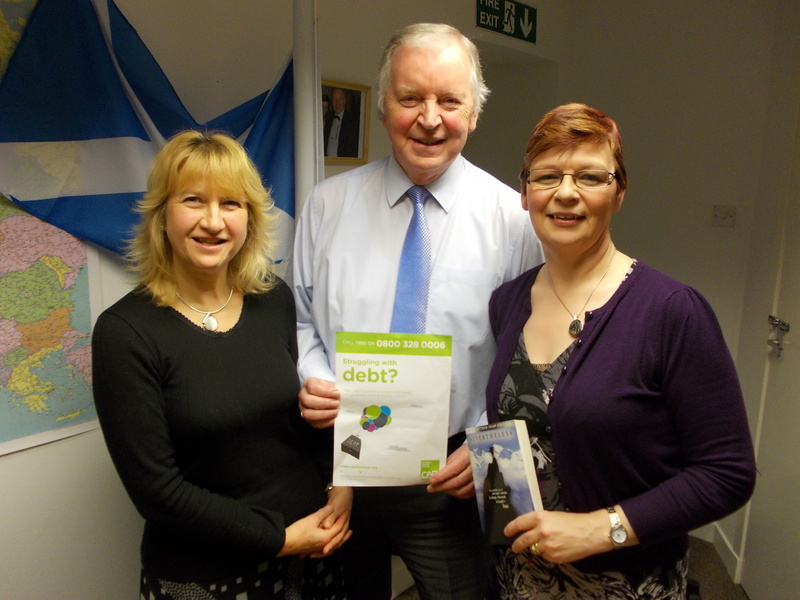 Julie Mann, Centre Manager of the Dunfermline Debt Centre, and Helene Kelly, Debt Coach and Links Coordinator for Fife, told Mr Walker about CAP’s combination of financial education, budgeting advice and insolvency services. Mr Walker said: “I was really impressed by what Julie and Helene had to say. CAP supports clients every step of the way to becoming debt free. It’s a very personal and friendly service, and of course it’s free – unlike profit-making debt counselling services. Once a person contacts CAP on 0800 328 0006, a Debt Coach and Support Worker will visit them at home and gather information so the team at HQ can work out a realistic budget. Next, HQ negotiates with each creditor and attempts to stop unfair interest and charges. The Debt Coach will then revisit the client to explain about the repayments negotiated with creditors. After this a CAP account is set up, which functions as a simple bank account. Clients make either a single weekly or monthly payment to cover bills and debts, which CAP distributes on their behalf. Savings can be added to the account. CAP can also advise about insolvency options, help with forms and even attend court with clients. The charity has won various awards, including the Credit Today “Debt Counsellor of the Year Award” in 2011. It ranked first in the Sunday Times “Best Small Companies to Work for list” in 2008 and 2009. 92% of established clients’ bills and debts have been paid on time, and 94% of clients in CAP’s latest client questionnaire rated the service as “life transforming” or “a great help”.